Today I feature my interview with Rob Cavestany, founding member and guitar player for the Thrash metal band 'Death Angel'. The band got their start in the early 1980's in the Bay Area, coming up alongside, or rather apart of the emerging thrash metal scene. 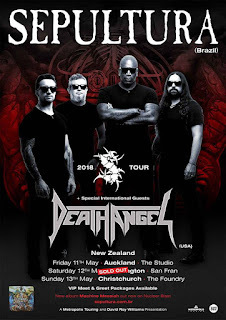 Death Angel, alongside Sepultura are set to play three shows in New Zealand in May 2018. D: How’s it going with yourself and death angel, I assume you’re keeping yourselves busy these days? R: Oh god yes- beyond. Keeping busy is an understatement with Death Angel that’s for sure. We keep busy, my man.